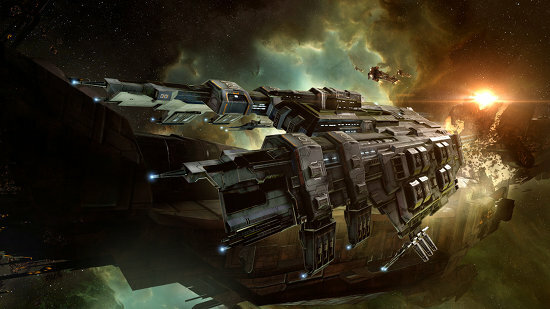 We here in Team Five 0 are preparing a massive reimagining of the fleet support roles in EVE, and we are ready to go into detail on the current plans and move to the next phase of the player feedback process. “Command Bursts” will form the backbone of the new system, completely replacing the existing Warfare Link system. These new modules will apply timed bonuses to all fleet-mates within a defined area of effect. To go along with these new Command Bursts, we will also be reworking the bonuses provided by leadership skills, mindlink implants, and boosting ships. These changes are currently scheduled for our big November release, and we have four dev blogs planned between now and then to go over the new system and many associated changes. This blog will cover the goals of the new system, the new mechanics and the plan for leadership skills and other modifiers. Blog two will go into detail on the changes to Mining Foreman gameplay, including the Mining Foreman Bursts, changes to the Rorqual and Orca, and the new Porpoise-class industrial command ship. Blog three will focus on the balance tweaks being made to combat-focused boosting ships to release alongside the new system. Blog four will be released right before the November release, covering all the changes to the plan we made thanks to your feedback and summarizing all the ship and module balance changes in the November release for easy reference. There are a number of goals that we consider crucial for the design of this new system -- many of which are not being met by the current warfare link and fleet bonus system. Force multipliers are a huge part of EVE gameplay, and we always want to ensure that there are engaging and valued roles for players who enjoy providing support to their allies. Many other dedicated fleet support roles such as logistics, command destroyer, interdictor, and interceptor piloting all involve tactical decision making and allow the best pilots to stand above their peers. The old warfare link mechanics leave something to be desired in this area (language warning). By building the new Command Burst system around specific areas of effect and enabling booster pilots to swap bonuses during combat, the new system will provide much more engaging and active gameplay. Although probing down and catching off-grid boosters under the current system is possible and can be very powerful, it requires support that is not always available to small fleets or solo players. Bringing all fleet-affecting gameplay into visible range ensures that players have the ability to interact with all relevant elements of their opponent’s fleets. Under the old fleet hierarchy system, this vulnerability would have become an undue burden on fleet commanders as reshuffling fleet positions as your booster ships die would involve unreasonable micro-management. Under the new Command Burst system fleet, hierarchy no longer matters for boosting, allowing Command Burst redundancy in the same way fleets already build logistics and interdictor redundancy. The existing warfare link system has a serious feedback problem. A small checkmark is the only way to see if your boosts are working, and pilots memorize the effects of certain boosts on certain stats to keep an eye on their bonuses. For opposing players the situation is even worse, as there is no way to detect that an opponent is boosted by warfare links and passive fleet bonuses. This can be especially frustrating for pilots flying in small groups or solo, as it strongly impacts the capabilities of your opponents without providing discernable feedback. In the new Command Burst system we are ensuring multiple layers of feedback so everyone involved can understand the situation. Command Bursts will have a clear visual effect indicating the area in which ships have received the buff. Command pilots will receive a combat log message that indicates how many allied ships have been impacted by each burst, so they can more accurately judge their positioning. Pilots that are receiving the bonuses will see new icons in the “effects bar” above their HUD that indicates what bonuses they are receiving and how long those bonuses will last. Opposing pilots can see the visual effects trigger when boosts activate and a new subtle visual effect that can be observed when a ship becomes affected by a burst. How do Command Bursts work? Command Bursts are high-slot modules that can be fit on the same classes of ships that can currently fit Warfare Links. There will be five types of Command Burst modules at launch, one for each of the existing fleet boost groups: Armor, Shield (formerly known as Siege), Information, Skirmish, and Mining. These modules must be loaded with ammo in order to activate, and the ammo choices determine which bonus the module will provide to nearby fleetmates. Ammo can be swapped in the field to change bonuses as the situation changes, although a reload time of between thirty seconds and one minute means that choosing the right time to swap bonuses is important. The ammunition for Command Bursts will be compact, inexpensive and manufactured by players primarily from ice product raw materials. We are planning for very large ammo capacities on the Burst modules themselves, so boosting characters will not need to reload often unless they are changing boost types. Command Burst modules will also require a moderate amount of capacitor to activate. When a fleetmate is hit by the Command Burst, their ship will receive a timed bonus lasting between 60 and 130 seconds that continues to operate even if they move out of range, or if the boosting ship dies. The bonus persists through warps within a system, but does not persist through docking and undocking or through system changes. The bonus is applied to the ship rather than the character, so swapping ships in space leaves the buff on your unpiloted old ship rather than having it follow you to the new ship. Since the burst that applies the timed bonus is instantaneous, any ships that enter range after the burst goes off will need to wait until the next cycle to receive their bonus. Command Bursts will not apply their bonuses to any fleetmates that are tethered or within a starbase force field, and ships cannot activate their Command Burst modules if they themselves are within a force field. Fleet hierarchy does not matter for these new bonuses, so any fleet member can provide bonuses to any fleetmate that is within range. All existing bonuses that use fleet hierarchy will be removed with this release. This means that passive bonuses provided to entire fleets from skills, implants and ship hulls will be removed and replaced with this new active module system. Titans will be receiving a special new Effect Generator capability that replaces their current passive bonuses (more details about Effect Generators later in the blog). There will be restrictions on what ship types can fit Command Bursts and how many Command Bursts can be fit to any individual ships. We are planning on converting Command Processors (the module that allow a ship to fit more links) into a rig, which should go a long way towards addressing a current source of imbalance between armor and shield tanked boosting ships. If a ship is allowed to fit multiple Command Bursts, they are welcome to fit multiples of the same type of Burst module or mix and match Burst module types. So if a Claymore pilot for instance wishes to provide two types of Skirmish boosts to its fleet at the same time it will be welcome to fit two Skirmish Command Bursts and load each module with a different ammo. Or it could fit one Skirmish Command Burst modules and one Shield Command Burst module and swap ammo on the fly to provide whatever bonuses are most appropriate to the battlefield situation. Like existing warfare links, multiple copies of any given Command Burst bonus do not stack on top of each other. The Command Burst system will only apply the bonus from the strongest version of each Command Burst effect that is applied to any given ship. However, Command Burst bonuses do stack on top of bonuses from other sources (such as modules and implants) and this interaction may be subject to diminishing returns (stacking penalties) depending on the attribute being affected. I want to start this section by making it clear that all these numbers are subject to change as we continue development of this feature. We are sure we’ll receive a lot of really valuable feedback from the EVE community over the next couple months and we’ll be updating the plan to take advantage of this feedback. We still have plenty of time before release so don’t consider any of these numbers set in stone. Our plan for skill requirements in the new system significantly reduces the barrier to entry for this role. We are also planning to adjust the skill requirements for flying the Tech 2 boosting ships such as Command Destroyers and Command Ships, which will reduce the training time to enter those ships slightly. More details to come in an upcoming blog. I’ll list the base bonus per charge type and the maximum bonus available with the most powerful ship/module bonuses and max skills/implants. Then we’ll go over all the potential modifying bonuses individually. You’ll notice that in several cases we have combined the effects of multiple old warfare links into one Command Burst. What are these Titan Effect Generators and Pulse Activated Nexus Invulnerability Cores? These are some special new modules that share a few gameplay similarities with the Command Bursts. Effect Generators are the replacement for the old passive bonuses from Titans. Titans will be able to fit these new modules (one per race) that warp the fabric of reality across a very large area of effect. Unlike Command Bursts, Effect Generators impact ALL ships within their defined area (friend or foe). The Pulse Activated Nexus Invulnerability Core is a new module that represents one of the many optional tools available to Rorqual pilots after the November Rorqual changes. This module can be used to make yourself and your industrial allies invulnerable for a limited time if needed for any reason. This is just one of the many enhancements that the Rorqual will be getting in November and we’ll be going into more detail about it in the upcoming dev blog. We’re really glad that we’re finally able to enter this next phase of community discussion and feedback about Command Bursts, and we’re especially excited that we’re finally this close to releasing the revamp of fleet boosting roles that have been in the works for so long. We have talked to many of you on the forums, twitter, Fanfest, EVE Vegas and other events about these systems and we know how important this rework is to many of you in the community. We know that many of you have opinions and insight to contribute on this topic, and we encourage you to pass your feedback to us through the official forums, in person at upcoming events like EVE Vegas and with the help of the CSM. All of us here at CCP are going to be working very hard over the next few months to iterate on these designs with help from your feedback, and we can’t wait to get them into your hands on the test server as soon as possible.